1 Let’s begin by just seasoning the bangus in salt and pepper. Fry until brown in color. 2 Get a pot and place the rice washing (hugas bigas), onions and tomatoes in. Bring this to a boil before simmering for 8 minutes. 3 Gently add the fried bangus with the Knorr Sinigang sa Sampalok Mix Original, chili, radish, okra, and sigrilyas. Just allow to simmer until the vegetables are cooked through. Taste and see if you need to adjust the seasoning. 4 Ta-da! Now, you have a wonderful dish to present to the family! 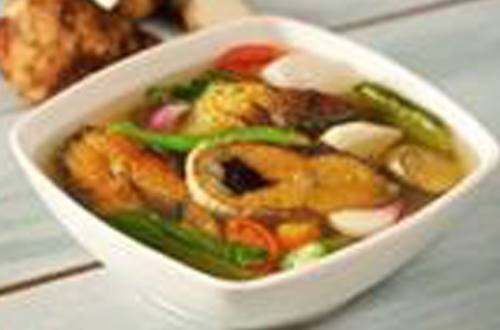 This Sinigang na Fried Bangus will bring smiles to their faces.